The Early Intervention Program provides part-day special education instruction and therapies for children from birth through four years of age with infant stimulation and preschool sessions. The Infant and Toddler Stimulation Program is a “center-based” program serving children from birth to approximately 18 months of age. Children have Individual Program Plans (IPP). Children attend two or more sessions per week lasting from one to two hours. Children are worked with in the areas of gross motor, fine motor, communication, cognition, and self-help skills. Parents and/or guardians may attend sessions to learn activities to carry over into the home environment enabling them to become active participants in their child’s education from the beginning. 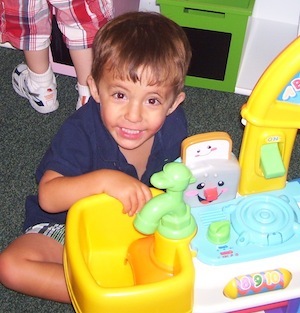 The Preschool Program serves children from approximately 18 months through 4 years of age. Preschool classes are half-day sessions and meet 5 days per week. Children have Individual Educational Plans (IEP). 2:1 and/or 3:1 student to teacher ratios are maintained in the preschool program with placement dependent upon the support the child needs to be successful in the classroom setting and to achieve measurable gains in development. Children are worked with in the areas of cognition, gross motor, fine motor, speech/language/communication, and social/self-help skills. Children receive weekly individual speech and language therapy sessions. Speech/language/communication instruction is embedded into each child’s activities throughout the day giving children the opportunity to utilize their communication skills within the natural classroom setting.